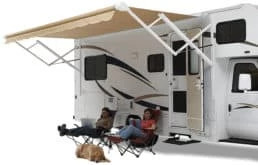 ShadePro has over 500 of the most popular RV patio awning models in stock. We have been trusted sellers and installers of the top awning brands like Carefree, A&E, Lippert, Faulkner, and Carter awnings for over 25 years. If you do not see the product you are looking for you can call our customer service directly to find the right model or part for your your RV, camper, trailer or 5th wheel. Choose from manual, electric complete patio awnings in a variety of colors so you can customize the look of your RV. Our RV Patio awnings come in various sizes to fit any rig whether its your camper, motorhome or tour bus from 12ft to 21ft.